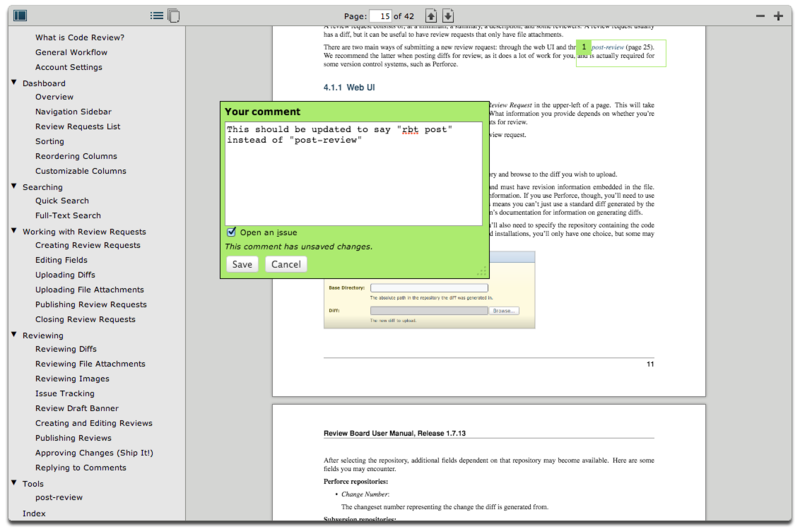 Review PDF documents that are attached to review requests, commenting directly on the text, all in the browser with no extra plug-ins. The ability to add capacity to your Review Board server by adding additional front-end servers. The outline mode in the sidebar now shows the tree structure of the table of contents. When a document has a table of contents, the sidebar now allows switching between either the outline mode or the pages mode. Scrolling behavior when using the mouse wheel or touch-pad gestures has improved significantly, making it easier to get all the way to the bottom of the document. Non-PDF documents like .docx are no longer detected as PDF. When attaching a PDF file with drag-and-drop, you can now click on the thumbnail to jump to the review UI to preview the document. Several issues with PDF rendering have been fixed. A fair amount of visual design polish. Once we have a final release, these features will be available on RBCommons.com for our larger tiers.